Valerie Richardson at the Washington Times offers a piece on the football players who did and did not “take a knee” during the national anthem. 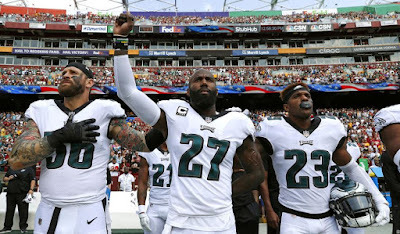 If you’re planning to watch the Super Bowl but you can’t stand the NFL takel-a-knee protests, you may want to root for the Philadelphia Eagles. Not a single Eagles player sat or knelt during the national anthem, one of just seven teams with perfect non-kneeling records, in a season that saw 684 such incidents, according to a study released Thursday by Sports Pundit. The other Super Bowl LII team, the New England Patriots, landed in the middle of the pack with 17 incidents of anthem sitting or kneeling, wedged between the Buffalo Bills with 16 and the Cleveland Browns with 20. Still, neither of the Super Bowl teams was in any danger of catching the leader: the Seattle Seahawks, which easily scored the most episodes of sitting or kneeling with 156, followed by the San Francisco 49ers with 110. Both of those teams play in the NFC West. Oddly enough, the division’s other two teams — the Arizona Cardinals and Los Angeles Rams — had zero take-a-knee protests. The remaining teams with no players sitting out during the anthem were the Chicago Bears, Dallas Cowboys, Minnesota Vikings and New York Jets.